I have been reeling for the past few days, ever since the tragic events in Newtown, CT on Friday – such a sad and scary act of violence, hard to even comprehend. It hits especially close to home for us, even though we’re 3,000 miles away, because our oldest daughter, Samantha, is in first grade, just like those twenty beautiful children who were killed on Friday. Dropping Samantha and her little sister Rosie off at school yesterday morning was pretty emotional for me. I looked at the shining faces of her first grade classmates and at the faces of the other parents, teachers, and staff members at our school, and couldn’t help but think of those people at Sandy Hook Elementary School – we are them, and they are us. As I’ve been struggling to make sense of all of this (which I can’t), I find myself feeling somewhat similar to how I felt after 9/11. In digging through some old emails, I found an email I sent out four days after 9/11 to my family and friends. I didn’t have a blog back then or an email newsletter, I’m not sure if I’d even written an article of any kind. However, in reading this email from more than eleven years ago, I was struck by how similar my thoughts and feelings are four days after the tragedy that took place in Newtown, CT. I thought I would share it here on my blog because it encompasses much of what I feel right now as well. I have had so many thoughts and feelings this past week, as I am sure we all have. Everything from sadness, to rage, to fear, to denial, to helplessness and then back again. I have found it very difficult to know what to do or how to feel. I have watched hours of television coverage and listened to hundreds of people speak about what has happened and what needs to happen – it has been overwhelming and confusing to me. I have also spent a great deal of time and energy talking to loved ones and friends as well as communicating with anyone and everyone I can by email. I just feel like I want to reach out and touch everyone I know and love… and even those I have never met. This whole thing has been a major wake up call for me as to what is really important. So much of what I think about, worry about, and talk about much of the time seems quite meaningless in the face of this tragedy. What keeps showing up in my head, in my heart, in conversations with other people, in amazing emails from friends as well as those from powerful spiritual leaders is the power of LOVE and the importance of GOD. When it all comes down to it, that is what is truly most important to me and in life! In the face of this horrible tragedy, we have an amazing opportunity to bring forth the power of Love and God – to tell the people that we love how important they are to us and to connect with that deep and sacred place of our own personal spiritual journey. I think it is so important that we honor our intense emotions and truly feel them – and let others to do the same. Even though this may be uncomfortable, especially with certain emotions – I know it is that way for me. On the other side of all of our emotions is Love. Love is the key to the kingdom. Love gives us access to healing, to forgiveness, and to peace. Love is the basis of all of our connections to one another. And Love is the foundation of our relationship to God. I believe that the essence of each of us is Love. It is who we are and what we all want. We each have an infinite amount of Love. I have been so inspired and amazed by the incredible outpouring of love I have seen throughout our country and our world in response to this crisis. Standing hand in hand with strangers at Glide Memorial Church and at Grace Cathedral in San Francisco this week, I wept at the Love I felt (from and for people I didn’t even know) and at the extraordinary power of the human spirit. We pray for courage and strength as we all deal with this crisis. Allow us to be real and open in the face of such intense sadness and fear. Please bring peace and healing to all those who have been hurt, directly or indirectly, by this tragedy. May we unite together in Love to heal ourselves, each other, and our world. Let Peace, Forgiveness, Healing, and Love prevail. I was scheduled to fly to Dublin, Ireland a few weeks ago for a speaking engagement and when I got to the airport I realized I’d forgotten my passport at home. I felt mortified and embarrassed – and then angry when I realized I wouldn’t be able to get on my flight. After a few hours of stress and drama, I was able to get myself on another flight, which would get me to Ireland on time for my event – although it did cost me quite a bit of money and forced my wife Michelle to have to drop what she was doing and rush to the airport with my passport. In the big scheme of things in life, it wasn’t a huge deal. However, it really upset me and caused me to reflect on how I react to mistakes – mine and other people’s. What I realized is that I don’t give myself or those close to me much permission to make mistakes. While mistakes aren’t a huge issue in my life, I actually spend and waste a lot of time worrying about making mistakes, and also find myself being unnecessarily critical of those around me when they make mistakes (both overtly and covertly). Michelle’s kind, accommodating, and empathetic response to my mistake (which ended up having a negative impact on her as well) was a great model and reminder for how I want to be when someone around me makes a mistake – helpful, loving, and compassionate. It also reminded me that having love and compassion for myself when I make a mistake, instead of judgment and criticism, is a much healthier and more positive way to deal with mistakes. How about you? How do you relate to yourself and others when mistakes are made? While it often depends on the nature of the mistake (some are bigger than others, of course), many of us tend to be hyper-critical with ourselves and those around us when it comes to errors. And the stress, criticism, and negativity we associate with mistakes can actually cause unnecessary harm, fear, and anguish – in essence, making a difficult situation even worse. What if we had more freedom to make mistakes and gave the people around us permission to mess things up as well? It’s not that we’d start rooting for or expecting things to go wrong, we’d simply have more compassion and understanding when they did (which at some level is inevitable in life and business). 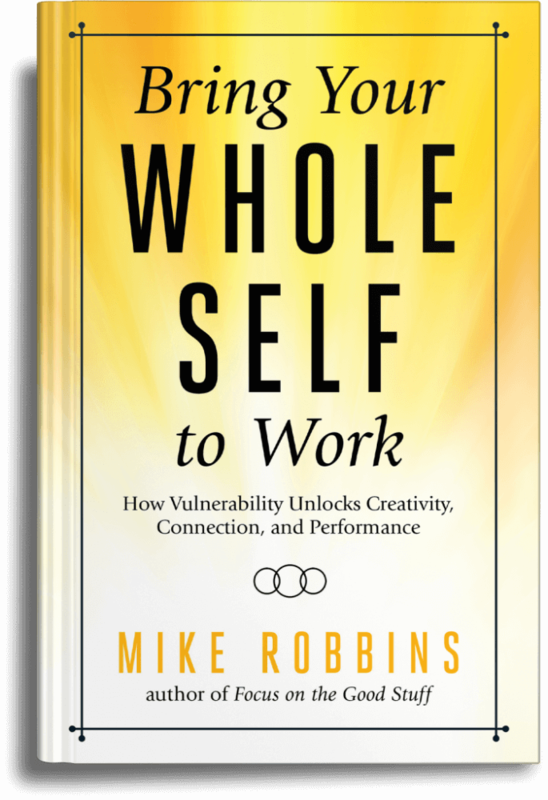 By giving ourselves and others permission to make mistakes, we actually create an environment within our own being and within our key relationships and teams, that is conducive to trust, connection, risk-taking, forgiveness, creativity, and genuine success. While it can seem a little risky, and even counter-intuitive, allowing more freedom for mistakes to be made, ironically creates the conditions for less errors to occur, and more fun and productivity to take place. Don’t Sweat the Small Stuff – As my friend and mentor Richard Carlson taught us in his bestselling book of the late 1990’s, “Don’t Sweat the Small Stuff – and it’s all small stuff.” The vast majority of mistakes we make in life really aren’t all that big of a deal. The bigger issue when it comes to mistakes is either our fear of making them or our reaction to them once they have been made (by us or other people). As we lighten up and practice letting things go, we find that most things we stress or worry about are really small things. Living life with this awareness, allows us to have more peace and a lot less stress. Forgive – When a mistake is made, especially a big one, forgiveness is an essential aspect of moving through it. Most of the time there is no malicious intent by the person who made the mistake (us or others). Sadly, we tend to spend and waste a lot of time and energy either with blame or resentment, instead of focusing our attention in a more productive, positive, and healthy direction – forgiveness. It is often most difficult, but most important, for us to forgive ourselves when we make a mistake. However, if we can remember that most of the time we’re doing the best we can (as are others), we can hopefully get off our own backs and allow ourselves to be human (which means we aren’t perfect, nor is anyone else). Look For the Lesson – There are often tons of lessons for us to learn when a mistake is made. While it’s not always the easiest or most enjoyable way to learn a lesson, it’s often quite effective as it gets our attention. One of my friends posted on Facebook in response to my passport incident from a few weeks ago and said, “Well, look on the bright side, I bet this will be the one and only time you ever do this in your life – you won’t forget how it feels.” She is probably right and most of the time when we make a mistake, even a really big one, we gain a great deal of knowledge, experience, and insight that is invaluable.